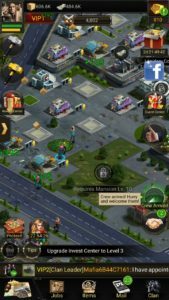 As usual, it starts with a tutorial in which you learn about the basic of the game; how to play Mafia City, about upgrading, buildings, attack, and much more. After the tutorial, you can manually handle all kinds of things as you want. The role of each building is different; for instance, counterfeiter building produces cash, cargo hub produces cargo. So you have to keep an eye on all the buildings. The mansion is the main building in the Mafia City game. Upgrading Mansion unlocks new building and feature and upgrading it also increases the robbing speed. To upgrade it, you need to fulfill the requirements; the amount of cash, wall level, and resources. You just tap on the Mansion -> upgrade -> hit the upgrade button. That’s it. As you progress, the amount or the number of resources will increase; so it would be better to upgrade other buildings too; counterfeiter, cargo hub, wall level, and more. Invest Center is one of the main buildings. As all of you know that training takes time, cargo & other resources are used in many upgrades, and your crew’s power matters a lot in battles; so, to improve overall performance[training speed, income from resources, power, attack, and more), go to invest center -> choose one of the properties and invest. It is one of the best ways to increase your gang power. Keep investing. Upgrading Invest Center unlocks new properties. Hospital is a place where the wounded units/troops are being treated. You send your troops to attack enemies, after the battle, you have to heal injured troops so that they can battle again. You can not treat unlimited numbers of troops at a time as there is a fixed limit, upgrade the hospital to increase the total wounded capacity. To increase the training speed and training capacity, you have to upgrade the club. Upgrade all the clubs you have built in your Mafia City to increase the training speed & capacity. Radar has two functions; spy and enemy status. It informs you the name of crime ops’ leader and their destination, can detect enemy’s resources amount, number of enemy’s defense crews, weapon, and more. Upgrade it to know more about the enemies and for the alerts. You can not send all the crews to attack enemies, there is a fixed limit/capacity. To send more troops to attack enemies, upgrade this building. Upgrading diner increases the maximum crime ops crew’s capacity. This is the place where you can exchange the equipment. Upgrading the Pawnbroker building increases the exchanging speed and reduces the consumption of check. This building protects your resources; upgrade it to increase its protection strength. Here you can exchange resources for gold and other rewards. Check it every day for best offers. Here you can trade resources with other members. The place where arms are produced and stored. Upgrade it produce more. Smelter produces metal. Upgrade it to increase the speed of production and the storing capacity. So these are the buildings in Mafia City game. Let’s begin the Mafia City tips, cheats, and strategy guide. Boosters, cash, gold are the main items in Mafia City game. One of the best ways to get these items for free is “tapping”. Tap on the citizens wandering on the road and you might get useful items such as boosters, cash, gold, energy points, and much more. Tap on the Mansion -> babe -> you will see a girl. Play the game and earn favor points. Keep collecting the favor points and unlock skills; tap on the skill option and there you can see the list of unlocked skills; earn favor points to unlock locked skills. These skills increase the production of resources, defense power, and much more. You need roses to play the game and you will get it as a reward. This game is all about upgrading all the buildings; to progress fast in the game, you have to take care of all the buildings you have built. Instead of focusing only on Mansion, upgrade all other buildings too.